Sometimes all it takes is a little decorative touch to get things ready for the Christmas season. 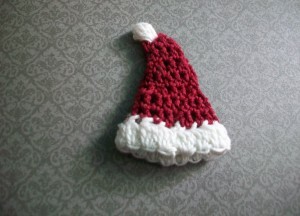 These little hats can be used all over to add a bit of festivity. You can use them as ornaments, gift tags, wreath accents, accessories for small dolls or figurines, or anything else you might need to make your holiday special. Try making two for a pair of earrings or turn a regular finger puppet into a Santa puppet. Inserting hook through top of hat, make a 5-dc bobble with white thread. This entry was posted on Saturday, December 5th, 2015 at 12:00 AM by Candace	and is filed under Free Crochet Patterns. You can follow any responses to this entry through the RSS 2.0 feed. You can skip to the end and leave a response. Pinging is currently not allowed. Thank you for this cutie! It is just what I needed for my package toppers. wondering, as I have found a couple flat angel patterns with no patterns to be found on the net, if you might be able to help me conjur up directions for them. I make scads of flat angels for assisted living facility, and also for tucking into cards, appreciate any different patterns I can get my hands on. thank you for your response, your help would be most appreciated. Hi, I think I know what you mean. I’ll look for some pictures to be sure then I’ll see what I can come up with.